The Chapel of St Mary, more commonly referred to as the Lady Chapel, was built in 1954 and the interior stonework was designed to blend in with that of the Chancel and Apse. When a spotlight was installed above the Coventry Cross of Nails stand in 2007 an unusual feature was noticed in one of the dressed stones to the left of the Cross and forming part of the reveal of the St John the Baptist window. The image of a face can be clearly discerned in the stone and whilst it may have been fortuitously noticed it was perhaps religiously prophetic that the image may be likened to that of the face of Christ. In fact, many visitors when shown this unusual phenomenon remark immediately that it clearly resembles the face of Christ to them. Acquired in 2007, the Cross consists of replica nails from Coventry Cathedral which was bombed during the Second World War and stands above the Pricket Stand for votive candles lit by parishioners and visitors. The Cathedral is a member of the worldwide Community of the Cross of Nails. The four Lady Chapel windows were installed in 1955 and the artist’s hallmark or punning device is clearly visible in the lower left segment of the St John the Baptist window. The artist used a bold sunblast effect to indicate the saintliness of the subjects, namely St Etheldreda, St John the Baptist, St Hilda and St Luke. The windows were all donated to the Cathedral by families in memory of faithful servants of the Diocese. The illuminated Centenary Book of 1950, in its glass topped display case, commemorated a century since the founding of the Cathedral (initially a parish church) in 1850 and it shows paintings and brief histories of all Anglican churches and chapels in the Diocese. The work of Miss Margaret Bishop, daughter of a former Rector, it contains gold illumination and at the time she was reputed to have been one of only two people in the country to have mastered the specialised art of gold illumination. When St Mark’s Church was granted Cathedral status in 1911 King George V presented these leather bound books to acknowledge the creation of the Diocese of George. His signature appears on the fly leaves of both books and when King George VI and Queen Elizabeth visited the Cathedral on 24 February 1947 they too signed the historic books. There are three flags hanging above the North Door. The colours of the George branch of the South African Legion were handed to the Cathedral for safe keeping in 1974 when the George branch was incorporated into the Southern Cape branch. The other colours on display are the Base Flags of the Royal Air Force and the South African Air Force 61 Air School which was established jointly by the RAF and the SAAF in April 1941 at the George Airfield as a navigation training school for World War II pilots. The Base was disbanded on 14 June 1945 and the flags were placed in the Cathedral during a formal laying up ceremony in October 1947. This unusual and striking banner, now framed to counter its fragility, was embroidered by members of the Mothers Union of Chelmsford Cathedral in England and was presented to its link organisation on George in 1963. Gold thread was used liberally in the embroidery, more particularly in the depiction of the George Lily (Cyrtanthus Elatus) which was copied from flowers specially purchased from Kew Gardens near London. There are numerous framed photographs, drawings, plaques, banners and historic narratives regarding the Cathedral, as well its Bishops, Deans and Clergy. Of particular interest is a photograph of King George VI and Queen Elizabeth leaving the Cathedral after their visit in February 1947. The two 17th century Flemish windows depicting St Andrew and St Paul, together with the other two similar windows in the South Transept, are arguably the oldest such windows in the country. They were part of a consignment of nine windows donated in 1855 or 1856 to Bishop Gray by the Master of Radley College in England and are presumed to have been salvaged from European churches or monasteries impoverished at the time of the French revolution or the Napoleonic wars. Two 17th century Flemish windows depicting St Mark and St Bartholomew adorn the South wall of the Transept. The provenance of this unusual lectern is a little vague but it dates back to at least 1852. Hidden somewhere on the lectern are the names of three people who were associated with the very early days of St Mark’s Mission Chapel. These ornate but dignified citations were issued on behalf of King George V to commemorate parishioners who perished in the conflict of 1914 – 1918. This sadly fading illuminated scroll from the King of Arms in 1953 approves and describes the heraldic provenance of the coat of arms of the Bishopric of George. The official warrant of approval was granted and assigned by the College of Arms on 25 February 1953. As it is difficult to readily make out much of the wording on the scroll a transcription has been framed alongside to facilitate easy reading of the wording. The original Bishop’s Sanctuary Chair, installed in 1911, is made of indigenous stinkwood and is an exact replica of the Abbot’s chair in the Celtic monastery on the Isle of Iona, Scotland. 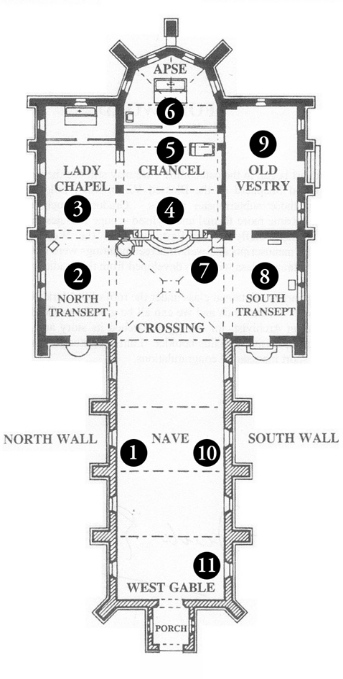 It was replaced in the Apse by the present Throne and Desk in 1930. The watercolour painting of St Mark’s Church, seen from what became York Street, is the work of Thomas William Bowler and was done in 1859. It probably represents one of the first pictorial depictions of St Mark’s Parish Church. The pulpit was donated in 1926 with stone sourced in Ladybrand in the Free State and cut and dressed in Cape Town. The unusual and impressive St Mark’s Hanging Cross was made in 1999 and is fashioned from kiaat wood. It features numerous symbolic embellishments in copper/brass bas-relief and forms a striking feature above the Chancel steps. The brass lectern depicts an eagle in great detail and was made in England in 1925 at a cost of £99 sterling. The lectern was donated to the Cathedral and all who subscribed towards its cost bore the name George. This is a replica of the original stone cross in Canterbury Cathedral and is made of stone taken from the walls of Christ Church in Canterbury. The bronze cross affixed to the stone is a model of an 8th century brooch found in the 1860’s under a Canterbury street. The stone from which the replicas were made was dedicated by the Archbishop of Canterbury in 1935 to mark the Jubilee of King George V and the crosses were sent to Anglican cathedrals throughout the world. It symbolises the close union between the Church of England and the Anglican Church of Southern Africa. Donated in 1930, the Altar unusually features two carved figures below the Mensa. On the left is the figure of an angel holding a chalice and paten while the one on the right is clasping a thurible for burning incense. The detail of the carved figures is astounding considering that they would most likely have been hand carved at the time. The Throne and Desk was fashioned from English oak by the Woodcarvers Guild in London in 1930 and donated in memory of the first Bishop of Pretoria. Local artist Ruby Reeves hand painted the Diocesan Coat of Arms which surmounts the front of the canopy. The four Apse windows do not follow any particular chronological sequence as they were donated at different times between 1927 and 1965. They depict certain aspects of the life of Christ, namely the Baptism of Christ, the Ascension, the Annunciation and the Resurrection. Positioned and consecrated in 1991, the window depicts Sophy Gray watching over three of the earliest churches in the vicinity which she designed: St Mark’s Church in George (now the Cathedral), the old St George’s Church in Knysna and St John the Baptist-In-The-Wilderness at Schoonberg in the Langkloof. This stall (or chair) was fashioned from indigenous wood in an unusual (and probably uncomfortable) style. The three windows in the North wall date back to the 19th century. The first two after entering the church are didactic in composition and each window tells two stories: Christ’s victory over death and the risen Lord in the Garden with Mary Magdalene in the first one and the Word of God and Christ in the Temple in the second one. The third window, closer to the Crossing, is the Bonus Pastor or Good Shepherd window given in memory of 18 month old Agnes Isabella Dumbleton who died in 1851 and was buried in the Cathedral’s graveyard. There are also three windows in the South wall. The two closest to the Crossing were given by the St Leger family and are known as the St Anna and St George Memorial Windows. The third window, near the Font, is the Price Memorial Window in memory of the first Rector of the Cathedral when the Diocese of George was constituted in 1911. It was placed in 1938 in a different position and moved to its present position in 1959. Presented in 1912 as a memorial to a departed parishioner, the Font was crafted in red Dumfries sandstone whilst the ornate cover was made of local stinkwood. The magnificent Müller organ was made in 1962 to replace the original Hill organ installed in 1879 and the console was specially designed and built to match the Cathedral furnishings. The organ boasts 1400 pipes, 35 stops, two manuals, 13 couplers and 35 speaking stops. Above the Loft, in the West Wall gable are three striking stained glass windows. The Quatrefoil window was made of glass fragments which remained when the 17th century windows were moved to new positions from time to time and was placed in 1940. The two windows below it reflect a more modern technique of stained glass artistry and the glass was imported from a factory in France by the artist, Leo Theron. The themes are of Baptism and Pentecost and the windows are known as the Meade Windows. One of the earlier graves is that of Agnes Isabella Dumbleton, daughter of the Dumbletons of Oakhurst Farm above the Wilderness and the Fairy Knowe Hotel, who died in 1851 aged 18 months. The founder of Bloemfontein retired to George in 1854 and died in 1856, at the age of 56 after an illustrious military and administrative career as British Resident of the Orange River Sovereignty (later the Orange Free State). He founded the town of Bloemfontein in 1846 on the farm of the same name and he was reputed to be related to Bonny Prince Charlie through his father who, legend has it, was the Bonny Prince’s illegitimate son. From 1848 to 1852 he laid the foundations of an administration which was later to become a model republic. He had ten children with his second wife and the town of Warden was named after his eldest son. His children were educated in an Afrikaans speaking community and they all played an important part in building up the Orange Free State. Three of his children bore names from the Royal House of Stuart (Charles, Henry and Elizabeth). His grave is adorned with an impressive granite marker or gravestone, erected by the citizens of the OFS in October 1940. The stone carries the crests of the cities of Bloemfontein and George. The Right Reverend Henry Sidwell was the 1st Bishop of George from 1911 – 1936. He was the first South African born priest to be elected as a Bishop in this country and was a Dutch scholar and eloquent speaker of that language. He founded St Winifred’s School for Girls in George in 1918 which sadly closed down at the end of 1943. Bishop Sidwell died in 1936. The Right Reverend Patrick Barron was the 4th Bishop of George from 1966 – 1977. Scarcely four weeks before he was due to retire in 1977 his wife, Kay, was accidently killed in York Street on her way from Bishopslea to morning service in the Cathedral. Bishop Barron died in 1991. There are two columbariums, the first having been built in 1963 and the second in 1971 from stone donated by a parishioner. The Wall of Remembrance was erected through the generous benefaction of Roger Johnson, whose son was killed in action in Afghanistan in 2006 where he was serving as a member of the Household Cavalry Regiment with Prince Harry. The ashes of 2nd Lieutenant Ralph Martin Johnson are interred in the Wall. In 1879 the iron barque ‘Mabel Young’ foundered near Ballots Bay on the Southern Cape coast whilst on a voyage from Calcutta to Aberdeen carrying a cargo of jute. There are five unmarked graves near the hedge towards the Parish Hall which were the last resting places of a passenger and four crew members. The headstone of passenger Charles E Shaw’s grave may be viewed in the George Museum. The obelisk was erected in memory of the Revd Hopkins Badnall, who was the Rural Dean of George from 1863 to 1869. Set in the wall to the left of the main gates is a stone plaque in memory of Catharine Ellen Andrew who was born in George and who died in 1933 at the age of 91 having been a lifelong member of the Parish. The right-hand side main gate pillar bears a memorial stone plaque erected to acknowledge the generosity of three named parishioners who made the enclosure of the grounds possible in the early 1990’s. The architect of St Mark’s Church, Sophy Gray, laid the foundation stone on 23 October 1949 but its exact positioning has been the subject of much conjecture over the years. It may well have been set in the north-west buttress of the Cathedral where chiselled markings of some date or other, in Roman numerals, appear on one of the stones. The almost obscure date appears to read ‘XXII’ and the stone, set about chest height, is now partially hidden by a holly bush. The date ‘1849’ has been scratched into the cement pointing above the stone but there is no other history relating to that.There are various other foundation stones to be seen in places outside the Cathedral marking various extensions made to the building over time.